Dexter Daily: Executive Producer Sara Colleton:"It's the Beginning of the End and It's All Crushing Together"
Executive Producer Sara Colleton:"It's the Beginning of the End and It's All Crushing Together"
The Hollywood Reporter talked with executive producer Sara Colleton on Thursday, just days before Michael C. Hall, Jennifer Carpenter and company return for the first of 12 final hours to see if both Dexter and his foster sister-turned-killer can survive the season. So how have producers been preparing for the end? How will Charlotte Rampling's Dr. Evelyn Vogel factor into complicated Morgan family dynamic considering Dexter and Deb's father, Harry (James Remar) turned to her to help create the Dark Passenger? THR turned to Colleton to get the scoop. Skip the jump to read the whole interview, and beware of spoilers. Can and should Deb and Dexter both survive? That's such a loaded question, yes they both should survive but we have a very involved season ahead of us so it's not something to anticipate at this moment. How are you preparing to end the series? Is there anything you haven't done that you've wanted to? It's been a question from season to season of what's believable based on what Dexter has experienced both from the outside coming in and his emotional journey with human nature and what it is to be a human. Each season has added on to that. I feel like it's come internally from Dexter. We're now in our last season and the central paradox of the show is that Dexter sees himself as a monster but yearns to be human. He's going to find out this year what the cost of self-knowledge is, what the full weight of being a human being is. We know that there is as much ability to experience pain as there is joy and it's not easy being human. It's the irony that he thinks of himself as a monster but we know in some way that he's the most human of us all because he feels everything and denies himself the pleasure to be happy. He feels like he doesn't deserve to feel happy, and that it has to be characterized or colored as a fake life. In spite of everything that's gone down, I still feel Dexter is a fantastic brother and was fantastic husband. In his attempt to fake it, he's really become a better man. How long have you know what the final scene is? Have you written it? For two years. [Showrunner] Scott Buck and [EP] Manny Coto are writing that last script. We have it all beaten out and we know what it's going to be and we've known it for a long time. Hopefully it will be satisfying and give some people something to think about with this eight-year journey Dexter has taken and what he's explored and what he's tried to do and what he's tried to become. Hopefully it will resonate with some insight for our audience. We all know that no matter what we do there are going to be a lot of people who are unhappy with it. We're trying to not think about that and just think of what everyone who has been on the show from the beginning feels is right and that's all we can do. No matter what we do we'll still be excoriated. 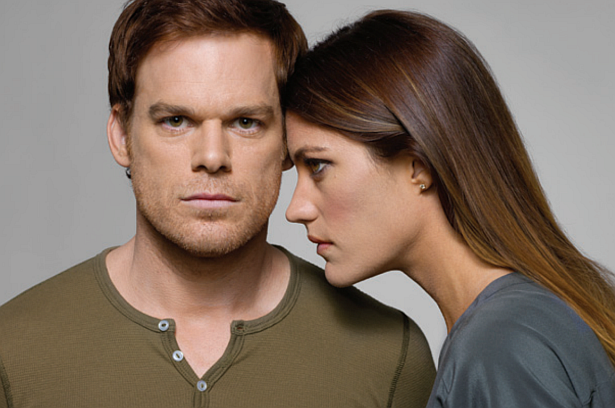 How will we see Dexter learn what it feels like to be human this season? This isn't going to come out of the blue; we've seen aspects of it starting in season two. By the end of season one when Dexter had his origin story and realized how he was created, he immediately began question, "Where was my choice? Was I born bad? Was I taught to be bad?" He started dealing with the fundamental aspects of being human. This season, they're all going to come a cropper. All these things he's pondered -- like in season four, he had no idea that by toying with Trinity (John Lithgow) that he was putting Rita's (Julie Benz) life and his family's life in jeopardy but he was feeling like he was on top of his game and could have a great family life, live in the suburbs, be a great dad and be great at my job and keep the Dark Passenger happy. He knew he should have taken out Trinity earlier than he should have in that season but it was a hubris issue. That's very human thing and he was punished in that the thing he cared about most in his life [Rita] was taken away from him. It was a devastating lesson. What have you learned from past seasons that helped shape how you wrap things up? Each year has informed the next year in that Dexter has to evolve. He can't stay "just a monster and I'm faking it." He has evolved and recognized that he got human aspects and then the ability to shut all that off and be pure instinct. That's what Dr. Vogel (Charlotte Rampling) is instrumental with this year. She helps him realize and makes him vocalize who he is. She makes him take a stand on who he believes he is after all these years of Harry telling him what he is. Her being here makes him say, "This is who I am and this is who I want to be" and claim it. Should we consider Vogel -- since she knows who Dexter really is -- a big bad? We've given up the idea of the big bad as a character. It's much more psychological. There is the Brain Surgeon, who is just touched upon. We have a long con kind of storytelling this year and you'll see those things grow. Vogel is a very enigmatic and seductive character who has an agenda by coming back into Dexter's life and their relationship will evolve as the season progresses. Vogel helped create Dexter's code. What can Dexter learn from her? Vogel is famous for her somewhat controversial theories on sociopaths and if it wasn't for their existence, mankind as we know it today wouldn't exist; they're the alpha males of society. Instead of hiding in the shadows and dreading and fighting who he is, Dexter should embrace it and realize he's perfect. But she learns more about Dexter Morgan than going into it and that's an interesting thing to see evolve. Can Debra forgive Dexter after she killed LaGuerta to protect him? Deb comes to an understanding about herself and about who Dexter is based on the series of options he was given and the parameters of information that he was given. She will eventually come to realize that yes, Dexter has done best he could with what he has. No one is perfect. Dexter's eighth and final season starts Sunday 9 p.m. on Showtime. How do you think the series should end? Hit the comments below with your thoughts and stay tuned to THR's The Live Feed for more Dexter coverage.